You are at:Start Reading»Pregnancy»Diet & Fitness»Is It Safe To Take Suji/ Semolina During Pregnancy? The consumption of a nutritive rich diet affects the development of the brain if the unborn baby, his weight at birth and even helps to reduce the birth deformities. A healthy and strong mother can even balance the mood changes and have a smooth labor and delivery. A healthy and happy mother will also have a healthy baby. Pregnancy is both a cherishing and a challenging one. With respect to diet, one can go crazy as there is a never-ending list of things that should be done as well as the ones that should not be. Everybody starts to load the mother-to-be with wise bits of advice, some of which are true while others could be a myth as well. Consumption of some foods is very vital but has its own positives and negatives. In this context, we will study about semolina, its nutritional intake, benefits, side effects, risks etc. Semolina refers to a thin yet granular flour which is made from durum wheat. This is widely used for the preparation of pasta as well as many other dishes. In India, it is combined with milk and sugar to prepare a sweet dessert. It is much darker and with a shiny golden color than other types of flours. It has an aromatic flavor and traces its origin to The Middle East but easily available in all parts of the world. What Is The Nutritional Value Of Semolina? Semolina is enriched with many nutritive qualities and is a source of fiber, vitamin B complex, vitamin E, has no acid fats, has low levels of both sodium as well as cholesterol and even has some minerals as well. What Are The Benefits Of Eating Semolina During Pregnancy? Keeps You Full For Longer Time: Since semolina is made from durum wheat, it keeps the stomach feel fuller for a long period of time. This help to keep weight gain in control and helps in shedding off excess fat. Prevents Anaemia: Enriched with iron content, (1 cup of semolina provides 8% of the recommended daily amount of iron!) it helps in boosting the blood circulation and prevents from anemia. Boosts Your Energy Level: Consumption of semolina is highly recommended for those who have a very active life as it is enriched with carbohydrates and releases energy slowly and gradually. Helps to Control Gestational Diabetes: Consumption of semolina helps to lower the blood sugar level. It has a low GI. Therefore, it releases sugar slowly into the blood, thereby, avoid a sudden hike in the blood sugar level. 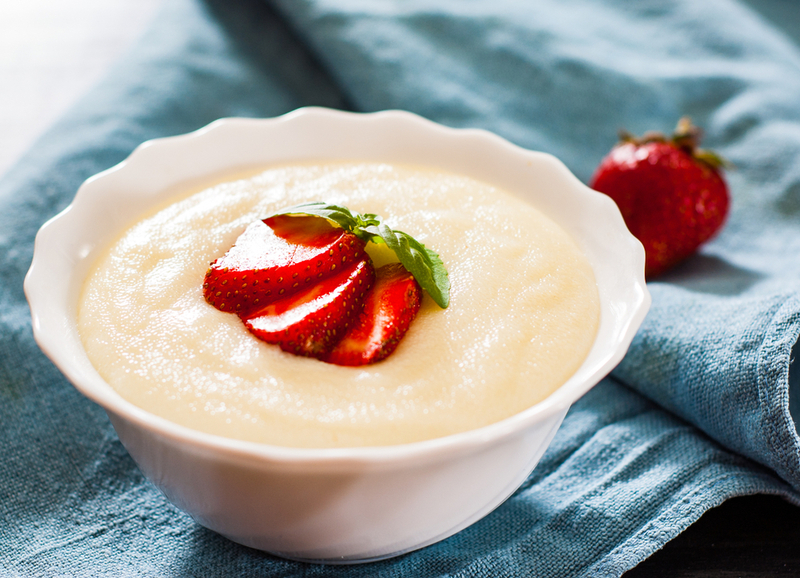 Boosts Immunity: Semolina has a good content of selenium, which is an important antioxidant. Antioxidants help to prevent the oxidation of cell membrane, that paves the way for several health issues and infections. Therefore, consuming semolina during pregnancy helps to make the immune system strong. Increases Bone Density: Semolina is enriched with calcium as well as magnesium that keeps the bones dense and strong. Maintain the bone health during pregnancy is important to avoid the risk of osteoporosis in the future. Good For Nervous System: Semolina has a good intake of zinc and magnesium which is crucial for the development of the nervous system of the baby in the womb. Enhance overall health of mother: Not only semolina contains fiber, Vitamin B-complex, and Vitamin E, it also low in sodium and cholesterol levels. All these factors smooth the progress of the pregnancy to some extent. Improves Heart Health: Intake of semolina is also good for the heart, as it helps in the prevention of infection, heart attacks etc. It is low in cholesterol level. It is beneficial in improving the cardiovascular health of the expecting mother. Facilitate Bowel Movements: Being enriched with fiber, it helps in the digestion process and smoothens the bowel movement. It is quite important during pregnancy, owing to the fact that constipation is the common issue faced by most of the expecting mothers. When Should I avoid semolina During Pregnancy? If You Have Wheat Allergy: One should avoid semolina in case one is sensitive towards the wheat consumption as it can lead to nausea, asthmatic conditions, stomach cramps etc. If You Have Celiac Disease: Semolina should be avoided in case a person has celiac disease as it can lead to abdominal pain, constipation etc. If You Are Sensitive to Gluten: Semolina is not advisable for those who have a gluten intolerance as it can lead to depression, hyperactivity or bad attention span. What Are The Allergic Signs Of Semolina During Pregnancy? What Are The Disadvantages Of Semolina During Pregnancy? Rich In Gluten: Semolina is very rich with gluten and many people have an intolerance toward it leading to other diseases. Therefore, it is unsafe for expecting mothers who are experiencing gluten allergy. Risk Of Allergy: If expecting mother has a wheat allergy, eating semolina can cause severe allergic reactions. How to Incorporate Semolina Flour in Pregnancy Diet? Use It Instead Of White Flour: Being high in gluten content, semolina is more elastic and stretchy and, at the same time, firm than normal white flour. Therefore, it is better suited for pasta making. Semolina flour, when used in pasta, also holds its shape in the water. Use It to Thicken Soups and Stew: Thicken soups, stews, and gravies with semolina flour. Unlike all purpose flour, semolina flour doesn’t forms lumps, for the reason that t5he level of wheat gluten is high. Use It Instead Of All Purpose Flour: Replace the semolina flourcalled for in your recipe with an equal amount of all-purpose flour. The end result will be better due to the high gluten content of semolina flour. Take 1 mango and peel it. Cut it into pieces and deseed. Blend the mango pieces in the mixer till it becomes smooth in consistency. Take a pan and melt 1 tablespoon ghee, add 10 halved and chopped cashew nuts and roast them on low heat till crisp and brown, being cautious not to burn it. Take from the heat and keep aside. Now heat ¼ cup ghee and roast 1 cup semolina till it is lightly roasted. 5 cups of water in a pan and cook over low flame. Add ½ cups of sugar and let it boil for about a minute. Add roasted semolina and keep stirring till no lumps are formed. Add mango pulp to the sooji sheera and mix gently. Turn off the gas and garnish with 10 halved cashew nuts and few drops of ghee. Boil 2 cups water, 1 cup milk, ¾ cup sugar, 2 saffron strands, and 1 teaspoon cardamom powder in a pan and stir till sugar dissolves. Simmer the liquid mixture on another stove. Heat ¼ cup of oil on low heat, add 1 cup Sooji (Semolina/ Rava) and roast till it becomes golden in color, not letting it burn. Stir the hot liquid mixture prepared earlier to the roasted semolina. Stir the mixture till it thickens. Take another pan and add 1 tablespoon of oil to which 10 cashew nuts are added until it gets golden and 2 tablespoons raisins are added. Take it off the heat and add to the sooji halwa. Boil 2 cups water, ¾ cup sugar, 2 saffron strands, and 1 teaspoon cardamom powder in a pan and stir till sugar dissolves. Stir the mixture till it thickens and then adds 1 cup milk. Thus, semolina is beneficial for the pregnant women and it is enriched with vitamins, proteins, and minerals with no cholesterol as it is good for the heart as well as the blood vessels. Even then the expectant mothers can have semolina in moderation as an excess of it can harm the mother as well as the baby. Previous ArticleIs It Safe To Use Body Scrubs During Pregnancy?